Aquarius aquanaut and film maker DJ Roller sent me this photo after a day of 11 hours of diving. His fingerprints were worn off and he was “ready to rob a bank.” Since the mission was about to end, he had to maximize his dive time. After Aquarius closes, there would be no other chances. You can read more about my adventures in Aquarius at Gizmodo or see my photos of mine on Instagram. And you can support Aquarius by donating to them. Throughout the past 20 years, surfer and shaper Glen Horn (also appeared in Cyrus Sutton’s Stoked and Broke) has been spending 3 months of his year, taking his 1955 Chevrolet delivery truck (aka “Big Red”) down to Baja for the remaining 9 months to surf, fish and live. Robert Pirsig, author of Zen and the Art of Motorcycle Maintenance, recounts his horrifying near death experiences crossing the Atlantic with his wife in the summer of 1979. Raymond Pechacek Jr. recounts the stories of his father, Raymond Pechacek Sr., who personally designed the pressure hull for the original Alvin in the early 1960’s. This summer, engineers at the Woods Hole Oceanographic Institution (WHOI) are preparing to assemble the latest version of Alvin, which will have 5 viewpoints instead of the 3 previous versions have contained. 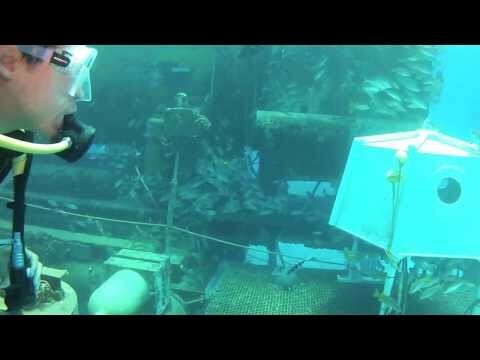 This is the rough draft and an uncut video of my descent to the Aquarius Reef Base off Key Largo, Florida. I was visiting Sylvia Earle for an interview. But what no one knows is that I also had the good fortune to be diving down with Fabien Cousteau, the grandson of Jacques Cousteau, who was visiting the base for the first time. Fabien’s grandfather built the first underwater habitat 50 years ago, and it was appropriate and poetic that he was seeing the base on its last mission, before NOAA ceases funding for the project later this year. The final version appears on Gizmodo.com but my editor removed all references to Cousteau because the story was too long and rambly. His version is better, but I’m publishing my first draft that speaks about Cousteau and the raw video here for you to see. I want to live in an apartment nestled atop a coral reef, on the ocean floor. The fish could be my neighbors. The sky would always be blue, even if always wet. And, instead of a stroll, I’d just go for a swim. This Saturday, I watched Aquanauts move into a home just like this for a week–the Aquarius undersea research base. I keep going back to this Secret Forts post on the feeling of Summer. Here are a few of my favorite shots but they’ve got a good 50 photos so you should visit them and soak it up. Brian Skerry is one of the most notable National Geographic photographers. He grew up in New England but he’s been everywhere since, having logged over 10,000 hours underwater in the last 30 years. He is currently working on his 20th feature article for National Geographic, says his website. Late last year, I had a chance to interview Brian and talk about his latest book, Ocean Soul, which is one of my favorite ocean photography books to come out in quite awhile. Unfortunately, because I despise transcription, I only got around to running this article now. It’s still as relevant, if not more so, than before, as I believe Brian is in the field at the moment, working his magic to bring us back photographic treasures. BS: I did do a lot of wreck diving early in my career, but I started out as just somebody who wanted to explore the ocean. You know, I had a great interest in natural history and marine life. And I think the reason I got into diving was because I wanted to swim with sharks and whales and dolphins, and lots of animals. I just didn’t have the resources–the money–to travel to some sort of exotic places. So I worked on a charter boat for about 10 years taking people to out to dive on German U-Boats, and you know, I got pretty good at that early on. I did thousands of shipwreck dives, things like the Andrea Doria, the deep north Atlantic wrecks, which was great training for any kind of diving. I mean if you can do that kind of diving–deep, dark, cold north Atlantic stuff–then you know, you’d be well-prepared. So you’re right, I did sort of start as a wreck diver, but I actually started earlier than that as just someone who wanted to explore the ocean and be with interesting animals.